Broida on MSPB Practice - Dewey Publications Inc. 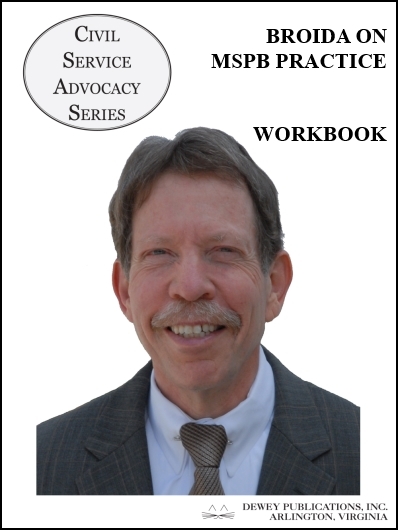 Presented by Peter Broida, who writes the principal treatise on MSPB practice, this video training course covers the major elements of representation of agencies and appellants before MSPB judges. The course includes Mr. Broida�s lecture (.mp4 video sent on a DVD-ROM), a workbook, and optional 50% off MSPB Basics: A Brief Guide for the Distressed and Perplexed and/or MSPB Basics: The Agency Edition. The workbook contains a course notes-outline, reference materials, cases and a bibliography.